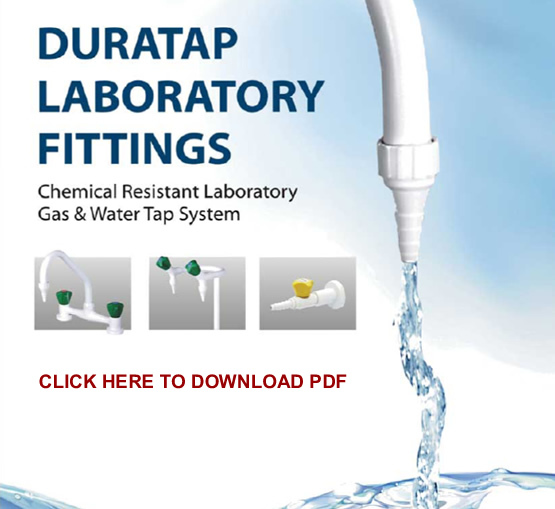 Dura-Tap Water Systems comprise a wide variety of quality laboratory water fixtures and fittings that are required in today’s specialized labs. Our water systems products are produced in a ISO-9001:2000 facility in Malaysia, South East Asia and have been used in the most advanced R&D and institutional learning environments around the world. The entire product line is produced to BS-2872 standards. The solid brass pressings’ are machined to close tolerances to ensure the highest product quality, and epoxy powder coated for prevention of corrosion in wet laboratory applications. The redesigned faucet bodies are produced in a variety of configurations with streamlined and enhanced styling. Water systems from Dura-Tap are available with fixed and removable serrated nozzles in accordance with DIN and US standards. The water fittings are tested to 10 bar (150 psi), with a design maximum working pressure of 7 bar (100 psi). This procedure allows for a testing pressure of 1.5 times the maximum working pressure for all water fittings. All Dura-Tap system products out perform the typical requirements found in secondary, middle, high schools and universities, under Ministry of Education requirements and those in the private sector. OSHA Rules and Regulations, along with ANSI and other regulatory bodies require that every effort be made to protect personnel in case of accidents. That protection now comes in the form of Dura-Tap Water Systems.